TFMoran will be celebrating at the BOB Awards Wild West Party on March 5, hope to see you there! Maybe even an impromptu line dance with Editor Jeff Feingold? Perhaps you’ll even run into a BOB Awards winner like the buckaroos from Silver Tech (who won for best new media agency) or the cowboys from Lucky’s Barbershop & Shave Parlor (who won for best barber shop for men). And you better watch out for those gunslingers from Southern New Hampshire University (they won for best online degree program). Thursday, March 5; 5:30 – 8 p.m.
A portion of the proceeds will benefit New Horizons for New Hampshire, so your attendance also helps those in need! 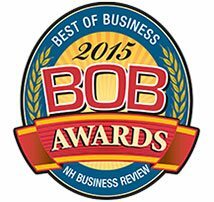 TFMoran, Inc. has been selected as “Best Engineering Firm” in New Hampshire Business Review’s BOB Awards reader’s survey, which honors the “best of business” in New Hampshire in over 90 categories. TFMoran was established in 1968 and is involved in major engineering projects throughout New Hampshire and the northeast. TFMoran and the other winners will be honored on Thursday, March 5, at the Grappone Conference Center in Concord. “With 2,700 ballots cast for the 2015 Awards, the BOBs continue to be considered a standard of excellence in New Hampshire,” said Jeff Feingold, editor of NHBR, “At this year’s award ceremony, we are celebrating with a Wild West theme – so dig out your cowboy hats and register at nhbr.com.” A portion of the proceeds will benefit New Horizons for NH. TFMoran’s recent purchase of MSC Engineering is making news! The formal press release about the merger is featured on the New Hampshire Business Review home page. TFMoran and MSC are proud to spread the word about the exciting combination of the two companies into one multi-disciplinary firm with a strong commitment to client service. TFMoran’s Chief Operating Officer, Dylan Cruess, was recently elected to the Greater Manchester Chamber of Commerce’s Board of Directors. Dylan is honored to continue TFMoran’s long history of involvement with the Manchester Chamber’s Board of Directors by following in the footsteps of TFMoran’s current and former Presidents, Robert Duval and Robert Cruess, who both served six year terms on the Board. The Greater Manchester Chamber of Commerce is a regional organization serving the city of Manchester and the surrounding communities of Auburn, Bedford, Candia, Derry, Goffstown, Hooksett, Litchfield, Londonderry, and Merrimack. The Board of Directors is the policy making body for the Chamber and is representative of the Chamber’s diverse business membership base. In addition to serving on Boards and Committees, TFMoran hosts the Chamber’s Network PM event each August. To see photos from last year’s BBQ click here! TFMoran is happy to share that it has joined the Greater Derry Londonderry Chamber of Commerce. TFMoran has completed many engineering and survey projects in the Towns of Derry and Londonderry so it made sense to support the local business community by joining the Chamber of Commerce. To find out more about the Derry Londonderry Chamber of Commerce, please visit their FAQ page. Some examples of TFMoran’s recent work in Derry and Londonderry include: the Prologis Northeast Logistics Center, permitting for PSNH’s 32W4 and 32W5 distribution lines, the Stonyfield Farm Manufacturing Facility, and the Parkland Medical Center Expansion.